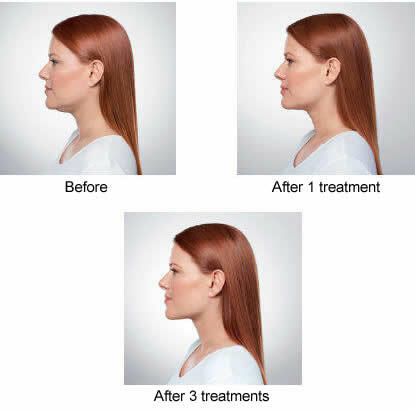 KYBELLA® is the first and only FDA-approved injectable treatment that contours and improves the appearance of submental fullness, sometimes referred to as “double chin”. This revolutionary procedure destroys targeted fat cells using deoxycholic acid, which is a synthetic form of a naturally occurring enzyme found in the gallbladder. Can Kybella® be used to treat other areas? Deoxycholic acid injections are currently only FDA approved to treat submental fat cells under the chin. Prior to the procedure you will be given a numbing cream, which you apply 45 minutes to 1 hour before your scheduled appointment time. The provider will apply a marking grid with colored dots, similar to a temporary tattoo, to the area indicating specific injections sites. Once the grid is in place, several injections are administered. You do not feel the injections, but some discomfort is experienced while the product begins to take effect, usually about halfway through the procedure. After treatment, we remove the marking grid, and apply ice to the area. Immediately after treatment, you will experience some discomfort when moving the head up, down, and side to side. Within the next couple weeks you will experience swelling and numbness. After 4 weeks you will see a noticeable contour in the jaw area, which can continue to improve up to 12 weeks. Multiple treatments are recommended. We recommend patients receive a series of 2-3 treatments spaced about 1 month apart.